Four story building with full basement on Belmont across the street from new Target surrounded by bustling retail. The building is completely vacant and in great shape ready or occupancy or development. The Building is zoned B3-3, is TOD and comes with five on-site parking spaces. One of the prettiest homes in Blaine/Southport Corridor! Updated by Buckingham Interiors in 2015, this Environs re-sale on a 37.5' lot offers an extra wide interior with generously proportioned rooms, sophisticated transitional finishes, 5 en suite BRs, a paneled library, a sleek home office, a den/exercise room, dual laundry centers, suburban-sized outdoor space and a 3-car garage. Ideal for entertaining, the main level includes a state-of-the-art kitchen that is open to the family and breakfast rooms. The fabulous master has a dream closet and the ultimate spa bath. A key benefit, the outdoor space includes a newly landscaped parkway, a fenced front yard with boxwoods and turf lawn, a spacious backyard with pavers, a roof deck, and a luxurious loggia with chandelier and fireplace. And the huge rec room is ideal for inside play when it's less hospitable outside. The neighborhood block parties are always a hit, and popular restaurants and the Southport el stop is nearby. It's fabulous! 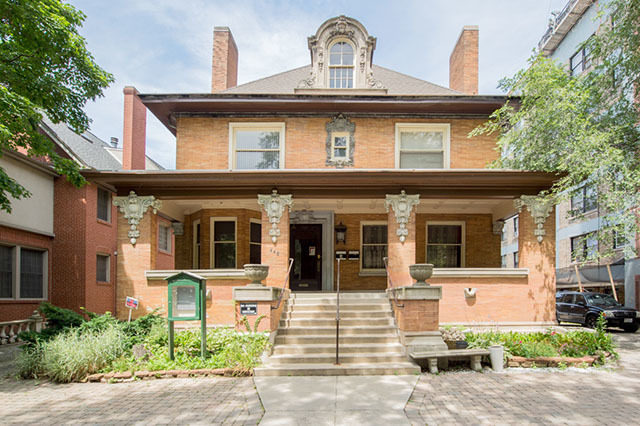 Gorgeous Landmark Foursquare mansion in East Lake View, designed by noted Chicago architect Frederic W. Perkins. Originally occupied in 1905 by Daniel O. Hill and from 1952 till present home of Serbian cultural organization. Exquisite woodwork throughout, 12" ceilings, preserved quality and charm from the turn of the century. Everything in this home is mostly original with the exception of a third story ball room being converted to a theater and basement known as "Cave" having characteristics of a night club.Coach house needs extensive work. Notice the Lot Size. The Square Footage includes the Basement.Sold AS IS! Check additional information link for floor plan. Average monthly electric $270. and gas $372. Rare opportunity to own a classic greystone home and a 3 story brick coach house on 37.5' wide lot in Southport Corridor. The Greystone features 5 bedrooms (4 bedrooms on 2nd floor), gourmet kitchen w/ Subzero, Miele appliances and family room w/ tons of natural light. Wet bar w/ Viking wine cooler, office/pantry, 10.5' ceilings, Kolbe windows, radiant heated floors, prism skylight above custom stairs, gas lanterns and leaded glass transoms. The 3 story Coach House is exceptional and features 3 bedrooms, 2 baths, central A/C and laundry in unit. It is perfect for guest/nanny quarters, home office, entertaining or additional rental income. 3 1/2 car garage is at grade with radiant heat and electric car charging station. Walk to parks, shops and Southport Brown Line. Excellent location on one of the best streets in Lakeview!